A often used technique in drawing is to look at the gaps between the objects in a picture, otherwise known as the negative spaces, often used by M.C. Escher. This technique can also be applied to open forms of beadwork. 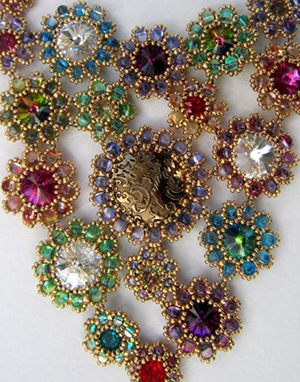 I quite often approach my beadwork, by making a collection of elements, and then joining them to make the finished piece. It is necessary then, to consider the negative spaces as well as the positive ones. The negative spaces give light and air to the design, but they also give you the opportunity to balance the design. These spaces should be as harmonious as the positive ones. Negative space can mirror the positive space, for example in a spiral. Obviously, not all designs have negative spaces in them, just the lacy ones and perhaps open weaves like right angle weave. You can play tricks with negative space by using ‘invisible’ clear crystal beads. See the purple and bleck trefoils in the bracelet above that have the clear crystals in the middle, they look much more effective than the filled ones. Here’s my Princesses Daisies Necklace which was put together very carefully considering the colours, shapes and negative spaces. The practical way of doing this was to draw an outline of the finished shape on a piece of paper. Then to arrange all of the daisies inside the outline and to take a picture. Because, of course, as soon as you start putting it together the pieces all move about!